Amit Chaudhuri's novella A Strange and Sublime Address is part of a collection of three novellas, Freedom Song. It is a story with a plot that is remarkable by its non-existence! It is not a story so much as it is a snapshot, a description of a certain time and place, capturing the minutae of existence of a certain family. Sandeep visits his mother's family in Calcutta for the summer, and Chaudhuri captures this simple summer vacation- the day-today activities of Sandeep and his two boy cousins, the goings-about of the typical Bengali household- with his exquisitely descriptive language. Here is a book that reads like a poem. "...Later, they went down to have lunch in the dining-room; they dangled their feet ferociously from chairs round a large, shabby table with pots thronging in the centre. Pieces of boal fish, cooked in turmeric, red chilli paste, onions and garlic, lay in a red, fiery sauce in a red pan; rice, packed into an even white cake, had a spade-like spoon embedded in it; slices of fried aubergine were arranged on a white dish; dal was served from another pan with a dropping ladle; long, complex filaments of banana-flower, exotic, botanical, lay in yet another pan in a dark sauce; each plate had a heap of salt on one side, a green chilli, and a slice of sweet-smelling lemon. The grown-ups snapped the chillies (each made a sounds terse as a satirical retort), and scattered the tiny, deadly seeds in their food. If any of the boys were ever brave or foolish enough to bite a chilli, their eyes filled tragically with tears, and they longed to drown in a cool, clear lake. Though Chhotomama was far from affluent, they ate well, especially on Sundays, caressing the rice and sauces on their plates with attentive, sensuous fingers. fingers which performed a practised and graceful ballet on the plate till it was quite empty"
I am a newcomer to Bengali cuisine. Bengali food is stereotyped by the heavy consumption of rice and fish, and is famous for its delicious milk-based sweets. Vegetarian Bengali food is traditionally "satvik", meaning "pure" and devoid of onions and garlic. Unlike the vegetarian food of the rest of India, Bengali veggie food is very mild as far as spices go. 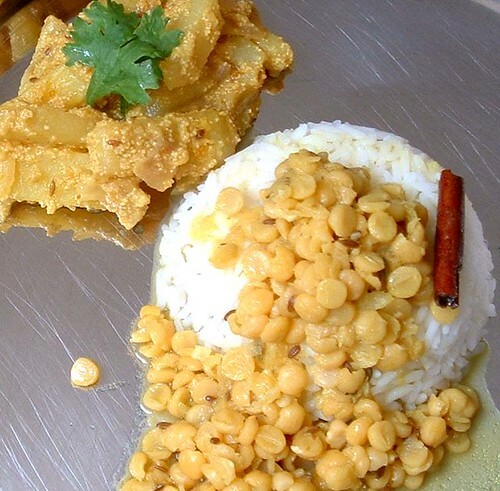 To make a simple home-style Bengali-inspired meal, I decided to make two classics: a simple chana dal called chholaar dal, a potato-and-poppy seed preparation called aloo posto and some piping hot steamed rice to round out the meal. The chholar dal recipe is kindly provided by my friend Sujayita. She served this at a dinner to me once, and I was delighted by this mild, sweetish, buttery tasting dal. I personally tend to not use chana dal very much, and when I tasted this dal, I was convinced that I should use it more. 1. Soak the chana dal for 8-10 hours. Then cook on stove-top or in pressure cooker until it is tender but not mushy. 2. Stir the ginger into the cooked dal and set aside. 3. Heat the oil and ghee, then add all the tempering ingredients. Saute for a couple of minutes. 4. Add the turmeric and saute for a few seconds, then add cooked dal and simmer for 5 minutes. 5. Season with salt and sugar. You can add more water if the dal appears too thick. Garnish with coconut, if using. The aloo posto recipe originates with my aunt J who lives in Toronto. Although she is Konkani, she was raised in Calcutta and is married to a Bengali; traditional Bengali food often makes its way to her table. When I visited her three years ago, she delighted me by serving aloo posto with typical Konkani-style dal, a true marriage of two culinary traditions! Once I returned home, I tried making it and it came out great. However, in a moment of culinary bravado, I neglected to write the recipe down. This is the best I can remember of it, so I'm not making any claims to authenticity with this recipe! 1. Soak the poppy seeds for 30 minutes. Grind them with the chillies, using very little water, to make a thick paste. 2. Peel the potatoes and slice them into thick stubby finger shapes. Rub them with salt and turmeric and set aside. 3. Heat the oil, then saute the cumin seeds and bayleaf for a minute. 4. Add the potatoes and saute for a few minutes. 5. Stir in the poppy seed paste and 1/2 cup water. 6. Cover and cook till potatoes are tender and well-coated with the paste (adding a little more water if the potatoes start sticking to the pan). See you soon with a new edition of "Recipe Watch", where I describe some recipes from my fellow bloggers that I have tried and loved. Have a great week ahead! Hello Nupur! This is a really cool idea - to have cuisine related to the theme in a book. The thought of Bengali cuisine makes me think of soft juicy rosogollas and delicious fish curries. Looking forward to trying Aloo Posto soon ! - Monisha. I love your Books and Food series. Thank you for both the recipes. hi nupur, amar shonar chef with bhalo recipes ....good old chef with grt recipes.....keep it up ! luv, yoma. Thats a really interesting series you have started. Both the recipes look so simple, yet so flavorful. Unlike the vegetarian food of the rest of India, Bengali veggie food is very mild as far as spices go. As far as my understanding goes, Andhra cuisine is the only one that has the *spicy* reputation. And it can be cooked in the mildest manner as well. I have sampled Keralite, Gujarati, Maharashtrian and other Indian vegetarian cuisines and they can be cooked as mild or as spicy as you choose... don't you agree? Cathy, I am soo glad you liked the dhansak!! :) yes, it is a great way to use a pot-pourri of dals and veggies. Archana, I'm so glad you like the series! Lakshmi, yes, I totally agree that all Indian cuisines can be made mild or spicy. I guess I was trying to say that Bengali veggie food tends to have subtle flavors rather than very bold ones (from what I have eaten and the recipes I have come across). Hi Eve, I'm sorry your comment was lost :( Yes, I have enabled word verification and comment moderation (and that is because of that annoying thing called spam). I had no idea comments were getting lost though. You could try e-mailing me instead, that should work better. the posto looks nice and sounds interesting. Might give it a try and let u know. Ive had the same problem as eve, with some of my comments getting lost . and rasagollas are a tough nut to crack. Ive tried making them atleast 10 times and the only time they came out decent looking were when mom and I forgot them in the refrigerator and checked them 5 days after making them. Makes me wonder about the freshnesh of the commercially available ones. Nupur, that looks like such a comforting meal. I'm guessing the addition of ground poppy seeds gives the potatoes a nice creamy texture. Your Le Creuset in the previous post looks tres cute. I am enjoying this yet another innovative-interesting series! Have you read the Namesake by Jhumpa Lahiri? It is an endearing story with plenty of bengali food references - Jholmuri, payesh etc. If you haven't read it already, I think you will like it! Cant blv it that I am seeing a recipe for Aloo Posto in your blog!! This is a dish that my mom used to make for us once a week, as she lived in Calcutta for almost a decade due to dad's job. I could almost taste it in my mouth once I read your post about aloo posto! Cant wait to try it out!.